Prior to starting deliberations regarding changes on the number of members of Seimas, Liberal Movement Seimas group prefect Eugenijus Gentvilas presented a resolution to the Seimas “Over the constant attempts to change the Constitution of the Republic of Lithuania.” With this, it was proposed to form an expert group, which would evaluate whether there is actual need to change the country’s most important document. The resolution was rejected after discussions. "Over 26 years, the Constitution ensured the country's economic and social development, the protection of human rights and proved its vitality for the long term needs of the state and people. However, in this Seimas session, over the past two months, I have now seen eight attempts to change the Constitution. MPs, who do not understand the meaning of the Constitution, are meddling with changes to it," E. Gentvilas is quoted in a press release. According to him, this term's Seimas constant initiatives for changing the Constitution are flawed, often represent only certain political interests and are not justified. "It is not us, MPs, who should rush to change the Constitution," E. Gentvilas emphasised. Currently, in order to change the Constitution, the move must be supported by no less than 94 MPs in a vote. Constitutional amendments are to be voted on twice with a break of three months, both times no less than two thirds of MPs must be in favour. The Liberal Movement MP pointed out that he has noticed initiated constitutional amendments where it is immediately clear it will not pass – "The current attempts are more often political public relations moves." E. Gentvilas admits that there are important and justified initiatives to change the Constitution, for example in order to resolve matters regarding the European Court of Human Rights ruling on Rolandas Paksas as well as regarding individual appeals to the Constitutional Court. However, others, E. Gentvilas points out, are more a matter of public relations and "the Constitution is no test firing range." I. Šiaulienė questioned, based on what criteria would such a group be assembled. She agrees with the idea itself, to not tamper with the Constitution when not necessary, but she is unsure why the proposal was made as a resolution. Irena Degutienė reminds that in 1992, the Constitution was approved by national referendum and MPs should not tinker with it. "There are constitutions in Europe that have been in power for centuries," she emphasised. Mindaugas Puidokas stated that he would like for Lithuania to form its own practice of constitutional amendments, rather than doing alike a certain other country. According to him, "It is normal that situations arise where we have to consider changing the Constitution." Arūnas Gumuliauskas stated he views the resolution as an excess document. The procedures to change the Constitution are already difficult. M. Puidokas supported such a view. 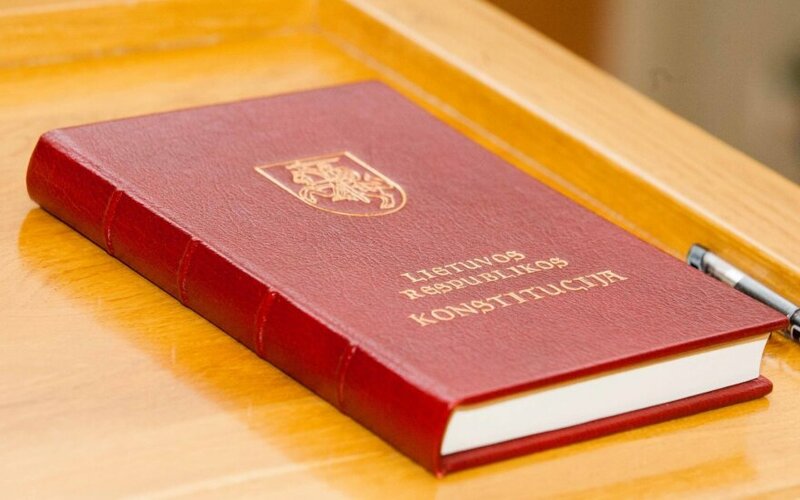 A Constitutional Commission already exists in Seimas. Its chairman Petras Valiūnas concurred with E. Gentvilas that the Constitution is no test firing range. However, according to the chairman, current controls are sufficient – the commission, which involves the most competent Seimas jurists.